NEW LISTING!! Wow! What A View!! Beautiful Oneida Lake Water Front Home. It's all about the View!! This Beautiful 3 bedroom, 2 bath lakefront home is located on Oneida Lake. Enjoy the breathtaking panoramic views from the oversized lakefront windows. This home is uniquely designed with a inviting warmth, making you never want to leave. 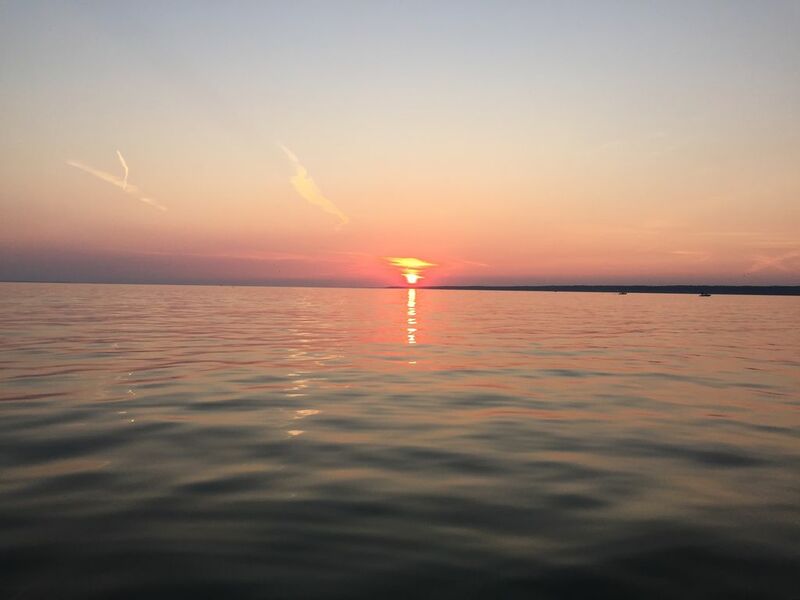 Oneida lake is known for its spectacular sunsets and is one of the best bass and walleye fisheries in New York State. Less then 2 miles from Historic Sylvan Beach, 15 miles to the award winning Turning Stone Casino, and 25 miles from Downtown Syracuse and the Syracuse Dome. Enjoy bonfires on the lake, family gatherings, or just pure relaxation in this beautiful lake house. The private dock will give you direct access to the lake and all of the activities it provides, including: excellent fishing, swimming, kayaking, boating, and more! Everything you could want or need is here. Boat launch very close. Sylvan beach very close. Several flea markets in area. The house was beautiful. The lake, the boat sling, the kayaks, fire pit. The kitchen is gorgeous. The bedrooms are large. Fireplace...wow. Helpful and very nice owner. Its worth it! 3 sisters, thier spouses and our 80 yrs old mother had a relaxing week spending time together. We plan on returning. Wonderful Stay! Everything was perfect! While the details mentioned by the owner in this listing are accurate, the rental property was even better than described! The home was clean and well-equipped. It was evident that Doug thoughtfully selected the quality furnishings, appliances, and even the linens. The kitchen and living room areas were spacious, attractive, and perfect for socializing. This home included a small bar area, several comfy seating areas in the living room, a dining room table with seating for six, along with six additional stools around the island. This open-concept area was very inviting. The huge windows looked out over the yard and the lake. The space was bright and cheerful with natural light during the day, while the special lighting fixtures provided ambiance in the evening. On warmer days, there were two air conditioners in the main living area, with additional window units in each of the bedrooms. We were always very comfortable, and we had some days when it was really hot and humid outside. The kitchen was impressive. It was new, with great cabinets, granite counter-tops, and high-end appliances. Everything we needed to make and clean up after our meals was provided: silverware, dishware, pots/pans, knives, cutting boards, a dishwasher, large stove/oven, and much more. I think it is important to mention that while the kitchen refrigerator was spacious. there was an additional full-size refrigerator/freezer in the garage! We kept extra drinks in this refrigerator. Not to be understated; there was also a ping pong table in the garage! There were two spacious, well-appointed bathrooms, as well as a great laundry area with large capacity washer/dryer. This was very convenient! Outside, there was a nice yard area with seating situated around a campfire, and additional seating: lawn chairs, double swing, picnic table, and umbrella table. We brought our 19 foot Tracker fishing/sport boat. While there was a dock, the electric boat lift was sufficient for our boat, as well as convenient. In closing, Doug was attentive, polite, helpful, and patient throughout the entire process. We will remember the times spent hanging out around the kitchen island, having ping pong tournaments in the garage, making s'mores around the campfire, and SO many hours spent on the lake fishing and tubing. Every year we join my brother and his family for a vacation. We were so thankful that we selected this rental property to enjoy together with our children. Pictures do not do this place justice! Its absolutely beautiful! Doug was an outstanding host and takes very good care of his property. Whether you are on a fishing excursion or a plain old family vacation, this place has everything you can possibly want. I will definitely book again. We were very happy with the location and the house. Doug was extremely helpful and made himself available during our stay if we needed anything or had any questions. The yard was great, the house was extremely clean. We would highly recommend this property. The "Camp" had everything we needed. The September nights were cool and the days were warm but not hot. The interior was nicely decorated as a hunting / fishing lodge with tons of wood and high end appliances. The indoor gas fireplace provided a warm place to sit and enjoy the evenings. The many lakeside windows provided a a great view of the lake where Bass could be seen jumping most days. We used the kayaks several times and had a couple bon-fires. Totally relaxing Anniversary trip. Doug was very nice and offered ideas of things to do in the area. We would definately return.